From creating Rihanna’s, Kim Kardashian West’s and Lorde’s most iconic outfits to cementing London’s best dressed It-girl scene, super stylist and creative director Avigail Collins is known for creating celebrities exciting new looks. But Avigail’s wardrobing skills extend even further: See her own streetwear-inspired line, Silver Spoon Attire, which was founded in 2013 alongside her husband (and fellow sought-after stylist) Damian Collins. The stylist’s high-profile music clients and global street style following make up a pretty impressive fan club. If anyone can spot the next big thing, it’s Avigail, which is why we’re thrilled to have her at Who What Wear UK to bring you a monthly column about what’s hot now. If there's one bag I recommend you actually invest in for 2018, my conclusion would be this season's beaded versions. It's a growing microtrend I absolutely love, and it really makes me happy. That kind of affordable combination doesn't come around every day in an It piece, so I wanted to share my new obsession with you. I mean, what’s not to love? They're fun, reasonably priced, wearable year-round (unlike basket bags, which can feel a bit silly in winter), update any old outfit and really remind me of being a kid all over again. In these weird, tough times, that's kind of a special thing. Keep scrolling to see the beaded bag styles I love the most and will be carrying on repeat every day of the week. 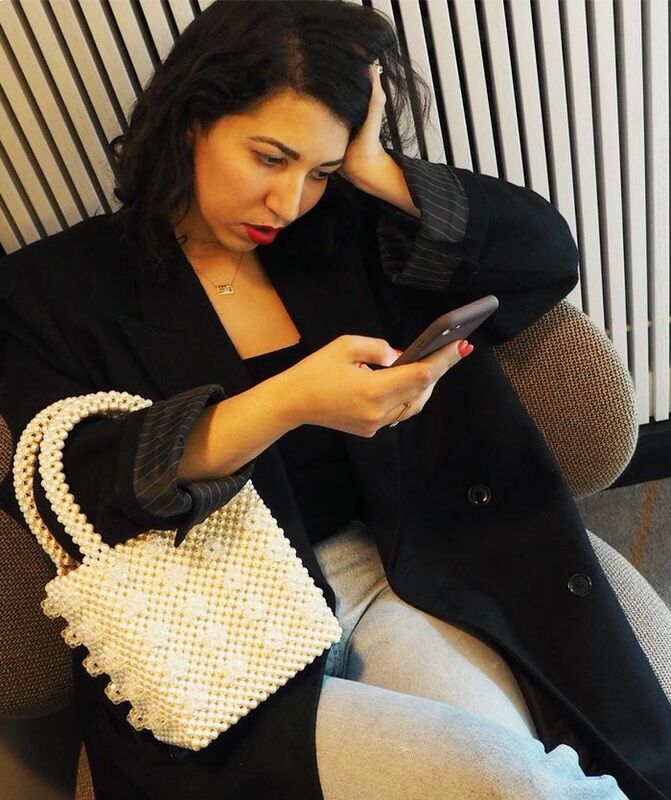 Shrimps has done a beautiful pearl beaded box bag, and it's been so popular for a few seasons now—you could say this British brand really kick-started the idea again. As it’s super girly, I've paired it with a more low-key tailored look: The juxtaposition of mixing the two makes it feel more effortless. With that in mind, I think this bag would also look great with a simple grey tracksuit and trainers. It’s all about combining that cute preppy vibe with something a little more relaxed. Susan Alexandra bags are what really rebirthed my obsession with this '90s trend. She's used crystal beads in really cute box shapes with amazing use of colour, and they've been all over Instagram the past few weeks. I can't wait to take one of these on my summer holiday and wear it with some gingham for the ultimate vintage pinup look. In the meantime, I'll be sipping tea at the Nobu Shoreditch dreaming up some summer looks whilst it rains outside. FYI: Toy frogs not included with the bag, but my son felt they should be photographed together! L.F. Markey has taken its own twist on the trend, and I love the way the brand has made it feel more neutral and classic with these brown-and-cream wooden beads. It means it’s far easier to wear day to day or to match with your existing clothes. The shape also lends itself to being a great work bag—which might seem surprising. I can fit my laptop in easily and the beads are light, so it wasn't heavy to carry. You should also check out the shop where these are stocked as there are other awesome things to discover—head over to Joan the Store. Ganni has yet again created the ultimate fashion situation with this bag. I first spotted it in a store called American Rag in L.A., and I've dreamed about it at least twice since then. The tiny beads on this one remind me of a bag I used to steal off my grandma. You could take this bag to a summer wedding with a gown or to the pub with a slip dress (like in this pic), or simply wear it with jeans. It's so versatile I think I've talked my self into buying it… and it matches my Nike Cortez perfectly, so it would just be mean not to. Feeling so ready for spring right now!